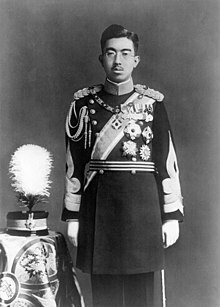 Hirohito (裕仁?, Apryle 29, 1901 - Januar 7, 1989) wis the Emperor (天皇, tennō?) o Japan the noo, an the 124t Emperor accordin ti Japan's tradeetional order o succession. He wis succeedit bi his eldest son, Akihito. In Japan, he is nou referred tae primarily bi his posthumous name, Emperor Shōwa. The wird Shōwa is the name o the era that correspondit wi the Emperor's ring, an wis made the Emperor's awn name upon his daith. The name Hirohito means "abundant benevolence". At the stairt o his ring, Japan wis awreidy ane o the great pouers—the nint-lairgest economy in the warld, the third-lairgest naval pouer, an ane o the fowr permanent members o the cooncil o the League o Naitions. He wis the heid o state unner the Constitution o the Empire o Japan in Japan's imperial expansion, militarisation, an involvement in Warld War II. Efter Japan's surrender o the war, he wis nae prosecutit for war crimes as mony ither leadin govrenment feegurs war, an his degree o involvement in wartime deceesions remeens controversial. ↑ Northedge, Frederick S. (1986). The League of Nations: Its Life and Times, 1920–1946. New York: Holmes & Meier. pp. 42–48. ISBN 978-0841910652. ↑ Yoshimi, Yoshiaki; Matsuno, Seiya (1997). Dokugasusen Kankei Shiryō II (毒ガス戦関係資料. II), Kaisetsu. Jugonen Sensō Gokuhi Shiryoshu (十五年戦争極秘資料集). Tōkyō: Fuji Shuppan. pp. 27–29. Wikimedia Commons haes media relatit tae Emperor Hirohito.